Batter up folks, we're heading back to the sandlot! 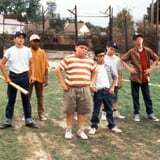 20th Century Fox is currently at work on a prequel to the classic 1993 film The Sandlot. The original writer and director, David Mickey Evans, is coming back to cowrite the script with newcomer Austin Reynolds. Deadline first broke the news and reported that though the plot details are still unknown, the story is said to involve the legend of "The Beast," the giant English mastiff that terrifies all the kids in the neighborhood. The cult classic recently celebrated its 25th anniversary with a special cast reunion and a two-day return to theaters. The heartwarming comedy is set in 1962 and tells the story of Scotty Smalls (Tom Guiry) who moves to a new neighborhood and is taken under the wing of local baseball superstar Benny Rodriguez (Mike Vitar). Scotty joins Benny's group of friends who form an entire baseball team including Hamilton "Ham" Porter (Patrick Renna), Michael "Squints" Palledorous (Chauncey Leopardi), Alan "Yeah-Yeah" McClennan (Marty York), Kenny DeNunez (Brandon Adams), Bertram Weeks (Grant Gelt), and Timmy and Tommy Timmons (Victor DiMattia and Shane Obedzinski). The boys go on a series of adventures that forever cemented their place in our hearts and made The Sandlot the iconic film it is today. Stay tuned for more details as development moves on, and check out what the cast of the original Sandlot is currently up to while you wait!